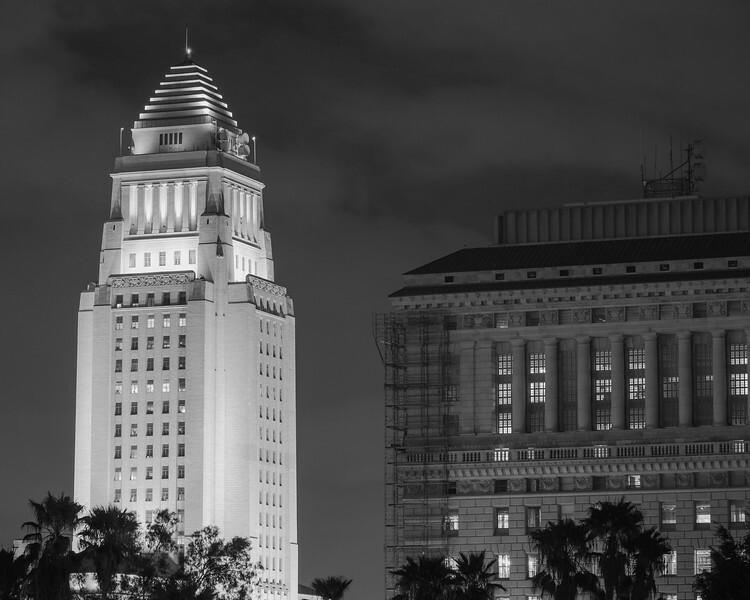 Los Angeles City Hall, two very different views. I've long admired the view of City Hall from Hill Street in downtown L.A. So coming home from a hockey game one night, I decided to try some night photography. I think this is kind of a boring image and I wish there were more trees at the bottom. But my partner says it's a nice shot. I'm not sure what to make of the second photo. I saw the top of the building poking through the branches and fired off a few shots. On the plus side, it feels original. On the down side, I'm not sure what I'm trying to say with it -- perhaps that there's a tree with barren branches on a hill above downtown!!?? Maybe it works better in black-and-white.